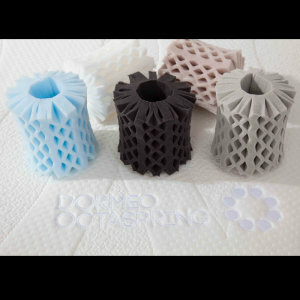 Dormeo Octaspring is a company formed to manufacture and market mattresses based on the invention by Willy Poppe, a Belgian, of Octasprings, springs made of memory foam and polyurethane foam. 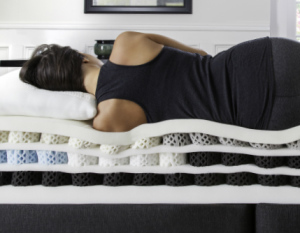 On this basis, Dormeo says, "We’ve reinvented the mattress." 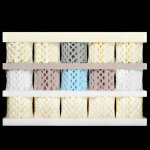 A look inside these mattresses shows that the are truly different. The Dormeo name for their product is the True Hybrid Bed. The company is now a susidiary of Studio Moderna, a company initially established to distribute products in Central and Eastern Europe as well as in Great Britain. Dormeo Octaspring in the United States was established in 2012, ten years after the invention of the Octaspring, to distribute this product in the United States. 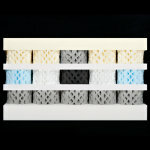 They are located in Plano, Texas, where they assemble mattresses from components made in Europe. When they have the requisite equipment, they will make the components here, too. This includes their MemoryCoils™ and EcoSprings™ foam springs. 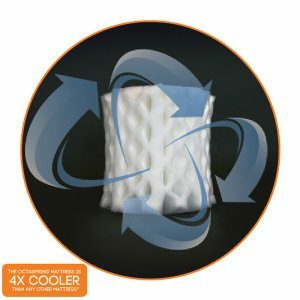 The stated advantages of the Octaspring mattresses are better airflow for cooling, 360° adaptation for pressure relief, variety of surface treatments and underlayers, greater degree of cradling, and adjustability and customization of zoning for individual comfort. A look at the Octasprings shows how they can act as springs. 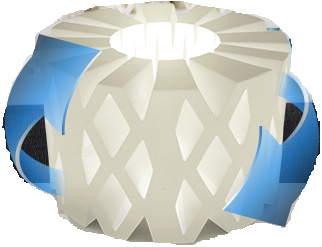 Dormeo has provided numerous photographs of its components individually and in assembly to illustrate what Octasprings are and how they work. Dormeo Octasprings are sold literally around the world. Industry news articles state that they are a "lifestyle choice" throughout Europe. Besides Europe and the United States, Octaspring mattresses are found in Asia, Australia, South America, and Canada. The current listing of Dormeo Octaspring models includes Dormeo Octaspring 9500, Dormeo Octaspring 8500, Dormeo Octaspring 8000, Dormeo Octaspring 6500 and Dormeo Octaspring 5500. Dormeo has two other lines besides the Dormeo Octaspring Line. These are the Dormeo Dolcé™ Line and the Dormeo Sérénité™ Line. The models in the DORMEO® Dolcé™ Line are FelicityBED, HarmonyBED, TranquilityBED, VitalityBED and SimplicityBED. 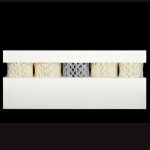 The models in the DORMEO® Sérénité™ Line are zenBED, luxeBED, blissBED, and restBED. Dormeo North America (DNA) showed off its foam spring mattresses, including new models, at the 2016 Las Vegas Winter Market. These beds still feature Octaprings, the innovative foam springs developed in Europe which have now inspired a few other manufacturers to make their own springs from foam and other non-metallic materials. A few new models have been added to the Dormeo lineup, including Dolcé Purity and Dolcé Affinity, two shown earlier which have now made it to market. DNA still has its two collections, Dolcé Line and Sérénité Line. Along with the introduction of new mattresses, Dormeo North America revised its website. Gone are the original Octaspring Line models (5500, 6500, 8000, 8500, 9500). Gone also are separate pages for the collections and the models. Now there is one page under the Mattress tab with all the models listed on it, including one not part of the two collections, complete with descriptions. One obvious advantage is being able to compare models without having to shift from one page to another. Other tabs are Home, Pillows, Technology, and Store Locator. For now, all the retailers listed by Dormeo North America are in the southern states: North and South Carolina, Georgia, Florida, Mississippi and Texas. The omission of Virginia is odd, since DNA has an affiliated manufacturing facility in Winchester, VA. Perhaps more stores are in the offing. Below the mattresses are listings of Dormeo's foundations. Two are flat-top slatted platform beds, one of wood and the other of steel. The steel base has tracks for hanging drawers. These are followed by two divans with storage drawers. The adjustable beds listed the previous year are missing, which may only mean that DNA is not supplying them at this time. All Dormeo North America mattresses are covered by the same warranty. The first ten years of the 25-year limited warranty are non-prorated. Warranty Info has the prorated schedule for years 11-25. Here are the current reviews for beds from "Dormeo Octaspring"